Part of the McPherson County Old Mill Museum and located across the street from the Smoky Valley Roller Mill, Heritage Square is home to seven historic buildings maintained as monuments to Lindsborg's heritage. The buildings include West Kentuck, the one room schoolhouse, 1879 Kansas Pacific/Union Railroad depot, Bethany Academy, the Erickson brother's workshop, a blacksmith shop, and Sweadal (first McPherson County Courthouse building). 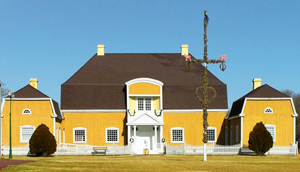 The most famous building though is the Swedish Pavilion designed by premier Swedish architect Ferdinand Boberg (who also designed Rosenbad). It was prefabricated at Ekmans Construction Company in Sundbyberg just north of Stockholm, Sweden. It was then dismantled and shipped to the United States by boat, landing at the Port of Baltimore. The materials were then transported by train to the building site on the fair grounds in St. Louis, arriving in late March of 1904. The Pavilion opened to visitors on May 9, 1904, and it showcased the best of Sweden at the Fair. After the fair, it was presented to Bethany College and was home to the art department for years under Swedish born artist Birger Sandzen. In 1969, the Pavilion was moved from Bethany College to the Old Mill Museum and was entered onto the National Register of Historic Places in 1974. It is still used for cultural heritage events throughout the year.